Slack for Non-Profits – EMail is Obsolete! The first point I should emphasize is that even if you don’t qualify for the non-profit program, Slack is still highly useful. 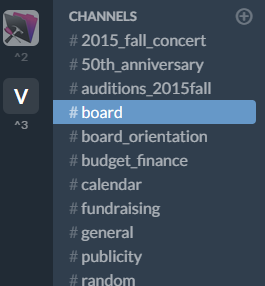 In particular, we were looking for the ability to invite users to our Slack board, without having those users be able to see the entire list of channels. For example, here is our channel list. You may have gathered that our group is a music group. We’re actually a semi-professional choral group of 36 acapella singers that sing five centuries of choral music. The calendar channel is a special channel. This is an integration which displays calendar events that are entered into our organization’s Google Calendar. You’ll note that the non-profit plan includes “unlimited integrations”. (The free plans include 10 integrations). Integrations are a whole separate discussion, but briefly, they allow events and information from other applications to appear (be copied to) a Slack channel and vice-versa. I’ve used this especially for integrating Trello project management boards with Slack channels. So, for example, I may have a Trello board for a particular grant application, and have additions and changes in the Trello board appear within the fundraising channel. Ok. Back to the other enhancements. An advantage of the non-profit plan is that we’ll be able to create a channel for, say the Concert Committee, and invite all the members of that committee to the channel. Those members can be restricted so that they can’t see the board channel, or indeed any other committees that they aren’t a member of. This is great for us…as we’ll probably end up having channels for each committee, as well as an AllMembers channel for everyone who sings with us. The other major advantage of non-profit status is that you can use the enhancements for no cost. I was interested to see that the Slack crew said if we had an actual paid account, we’d be spending US$640.00 per year, and that is just for our current subset of our full membership, (basically the board of directors). By the time we add our committee channels and the rest of our members, we’ll be getting the equivalent of at least double that amount. Not bad for a few minutes of filling out the application. What are you waiting for? Apply for a Non-Profit Slack account now. You’ll need a 501c(3) letter, testifying that you are granted non-profit status. And I’d love to hear how you are using Slack in your non-profit; send a note or leave comments. This entry was posted in Software and tagged Grants, http://schemas.google.com/blogger/2008/kind#post, Human_Resources, Software, Workflow on September 21, 2015 by lkeyes70.